Forged steel nut splitters. Chrome molybdenum blades. 2 - 15mm and 15 - 22mm. I found the nut splitter brilliant much easier than trying to undo rusted nuts. Before I purchased this product I read 3 reviews on your website. Two were very positive but the third said the splitter was blunt after cutting one copper nut. I really can''t understand the problem that the third reviewer had! I split 14 steel nuts with no problem at all. It cut through the nuts easily and it seems to be as sharp now as when I started. As they say, "It does what it says on the tin"
A useful tool at a competitive price, sorted the problem with ease. Very good quality and value for money. Went through nuts like butter. Very good materials and good finishing. I just added some grease to the screw to ensure a smooth work. I used the big one to break a 16mm nut. It worked very well and with almost no effort. Only used a handful of times to get me out of trouble. Seems to be a well built tool and works perfectly. I have owned better quality splitters than these previously. After only two uses the point is becoming blunt and bent. The nut splitter is a cracking tool to own. I have found it invaluable when working on old cars and bikes, often you come across a rusty nut that has rounded with age and the spanner slipping. Out comes my Nut Splitter, job done. Bought this nut splitter to help with the restoration of a car, this tool is totally indispensable when working on old cars, it save a huge amount of time and effort and saves damaging parts. 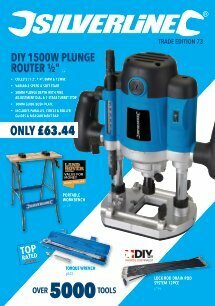 If you have not got one in you arsenal of tools its about time you bought one!! Nice clean looking design, which does exactly what it says on the packet. Easy to use, saves a lot of time trying to loosen a nut with lubricants. Good price for a good item. This nut splitter set was a great addition to my toolbox. It works well except on very hard and old nuts - then I used an angle grinder first and then the nut splitter and it worked well. This Silverline Nut Splitter Set 2pce is guaranteed for a period of 30 days from date of purchase against a fault developing in either the materials or the workmanship during manufacture. You can register for your Lifetime guarantee by registering your product online. Any faulty goods will be repaired or replaced free of charge.